How did we come to join the Orthodox Church? This is definitely a FAQ and, as the anniversary of our baptism approaches, it seems fitting that I should take a brief look at the reasons why a middle-aged Englishman and his wife came to join the Greek Orthodox Church. 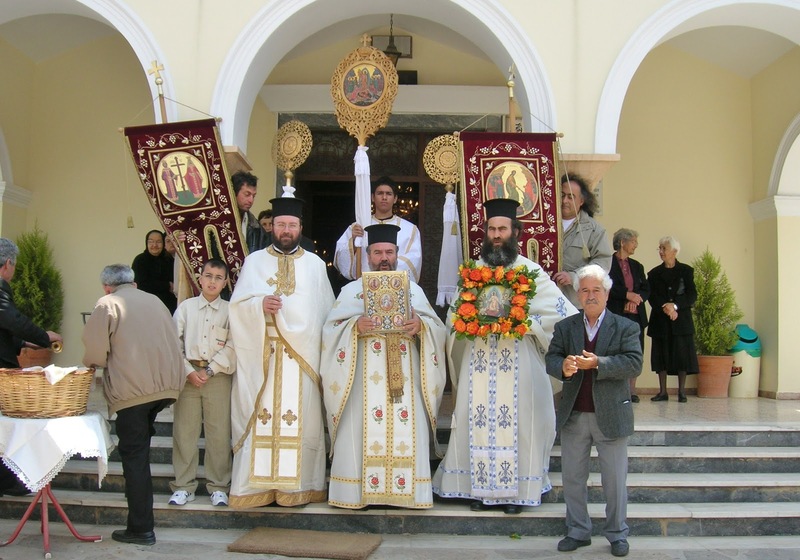 When we moved to Crete in 1994, we were members of the Anglican Church but found no problem in attending our local Orthodox church where we were welcomed by the priests and the congregation alike. We found that the Liturgy was similar in many respects to the service we were familiar with and we could follow it and even participate to a great extent. However, the fact that we could not actually take communion left us feeling somewhat unsatisfied. At that time, the nearest Anglican church was in Athens which would be quite a long swim on a Sunday morning so, knowing that we intend, God willing, to live in Crete for the rest of our lives, we began to look into the possibility of being baptized into the Orthodox Church. We soon discovered that not only were the services similar but the differences in belief were, in many respects, small. Anglicans and Orthodox say the same creed - almost - and even many of their prayers are similar, if not identical. Differences such as the way we cross ourselves and veneration of the icons did not amount to major ‘show stoppers.’ OK, I haven’t forgotten the Great Schism and the dispute over the 'filioque' (the addition of the words 'and the Son' to the Roman Catholic and Anglican creed). However, unless you’re a theologian, the difference between the Holy Spirit proceeding from the Father or proceeding from the Father and the Son is a bit obscure. Yes, of course the difference has some important implications but, since we didn’t understand it anyway, it did not seem a major barrier to us. We believed and we believe in God, the Father, the Son and the Holy Spirit. We believed and we believe that Jesus was both fully God and fully man. We believed and we believe that “God so loved the world that He gave His only begotten Son that whosoever believeth in Him should not perish but have everlasting life.” No problem! So, there did not seem to be any reason why we should not seek baptism. As we found out more about the Orthodox Church, however, we discovered some unexpected treasures which gave positive reasons why we should seek baptism. Through the ancient liturgy and the icons, we found a feeling of unity with the historic Church. The way in which a sort of reverent informality exists in the churches was a delight, especially the way children are treated as full members of the Church. We found that, unlike many English churches, solemnity and reverence are not the same as stuffiness and pomposity. The way that the Church Fathers express the idea of God’s judgement, emphasizing His mercy and love rather than vengeance and justice appealed deeply to us. And the glorious, emotional and powerful services of Holy Week were a wonderful discovery, even though the locals' insistence on throwing loud fireworks outside the churches even during the services was a trifle distracting! I shall be dealing with some of these aspects of the Orthodox Church in more detail in later blogs. There were, of course, a few difficulties. There was the practical problem of training our hands to make the sign of the cross from right to left rather than left to right. Indeed, since in the Anglican Church we would only cross ourselves rarely, we are still not used to doing so outside church. I must here confess that I sometimes feel that piety can go too far. One of the most terrifying experiences of our life in Greece was when, passing a church on a hairpin bend, our taxi driver who already had his mobile in one hand, took the other off the steering wheel to cross himself! Another area where we found some difficulties was fasting. In England, fasting for us had generally meant not having breakfast before communion and sometimes giving up chocolate for Lent. We therefore found the severity of Orthodox fasting rules very hard on middle-aged stomachs. Indeed, after our baptism, when I found out that the Great Fast rather than being forty days was really about fifty and included giving up beer, I jokingly asked my priest if I could renegotiate the contract. In his usual way, he smiled, his eyes twinkled and he just said, “You should always read the small print!” So, as far as fasting is concerned, - I do my best and trust to God’s understanding and love. Please feel free to comment or give feedback!